Monique Lamoureux-Morando exults in her star-spangled moment. GANGNEUNG, South Korea — The arena had alternately been hushed by tension and gone delirious with action, caught in this delicious web of hockey magic, so ready to crown a gold-medal victor but so reluctant to ever let this game end, this beautiful, heart-stopping brand of hockey Team USA and Team Canada have allowed us to come to expect from the two best programs in the world. 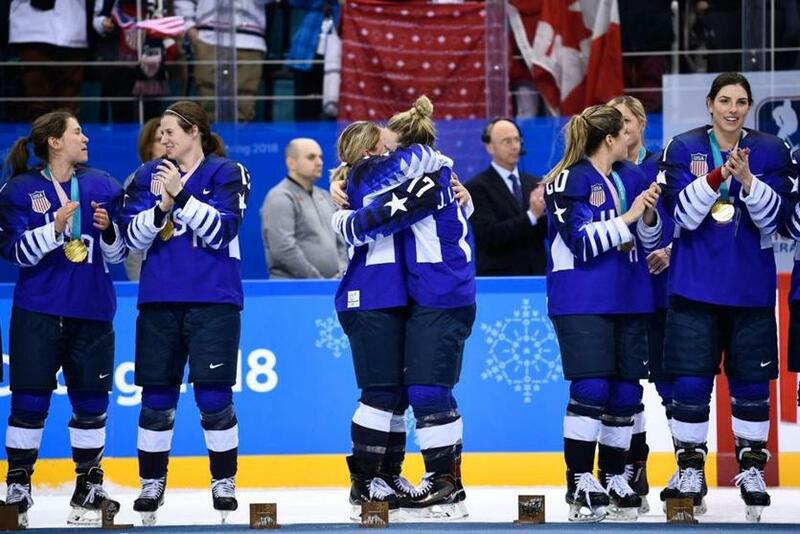 When it was finally over, when one veteran American scoring wonder had converted her shootout attempt and one ridiculously poised young American goaltender had stopped her final one, is it any wonder the woman who secured America’s first hockey gold in 20 years couldn’t even remember how she did it? 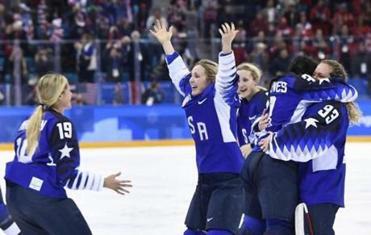 “I feel like I kind of blacked out,” Jocelyne Lamoureux-Davidson said in the heady hours after Team USA’s indelible, incredible, intense shootout victory over Canada — a 3-2 decision earned across 60 minutes of regulation hockey, 20 minutes of overtime, six rounds of penalty shots, and let us not forget, four years of heartache and two decades of disappointment. Just turn on the television, Jocelyne, because your goal will no doubt be the backdrop to a glorious American morning, destined to live forever in the hearts and minds of a country that might have slept through the overnight action as it happened, but years from now will no doubt claim to have witnessed it live. Goals like this one are destined to be remembered. It was that good. That ridiculous. That remarkable. Jocelyne Lamoureux-Davidson scored the winner in a shootout to defeat Canada. “So sick,” teammate Gigi Marvin called it. With a deke for the hockey ages, Lamoureux-Davidson managed to leave brilliant Canadian goalie Shannon Szabados all but turned inside-out, stretched to her right in anticipation of stopping one shot, only to be left flailing to her left unable to stop the relocated puck from slithering in. “Just her patience,” Marvin said. 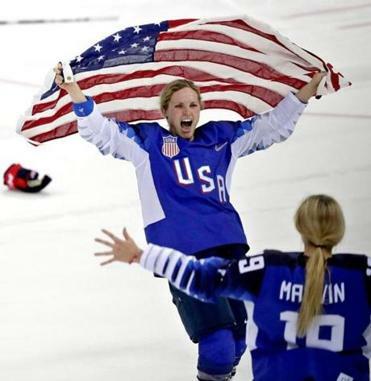 “Talk about the moment, being on an Olympic stage, for a gold medal and you’re in a shootout and she kind of pulls a little bit of a T.J. Oshie, just going back and forth. It’s a move Lamoureux-Davidson calls “Oops, I Did It Again,” christened such by the personal coach who spent the better part of the last four years working with her on shooting. “Ever since Sochi,” she said. Sochi. Is there any other way to frame what the United States did here in South Korea? Any other way to understand the motivation, the drive, the relentless pursuit to replace the maddening narrative the Americans wrote four years ago? But let’s not rely simply on the disappointment of blowing a late lead and losing the gold-medal game in overtime. How about we go and drop these players, so many of whom were on that ice four years ago, and put them right back in an eerily similar scenario, tied, 2-2 (only this time making the Americans overcome the 2-1 deficit), heading to overtime, against the only real rival either of them has, gold on the line, everything at stake? How about we really make them prove all that talk about the strength of their bond, how these past four years provided cement enough, but was somehow made even stronger by these last 10 months, when they risked it all to stand up for their salary rights, forcing USA Hockey to support them the way it should have been doing for years? 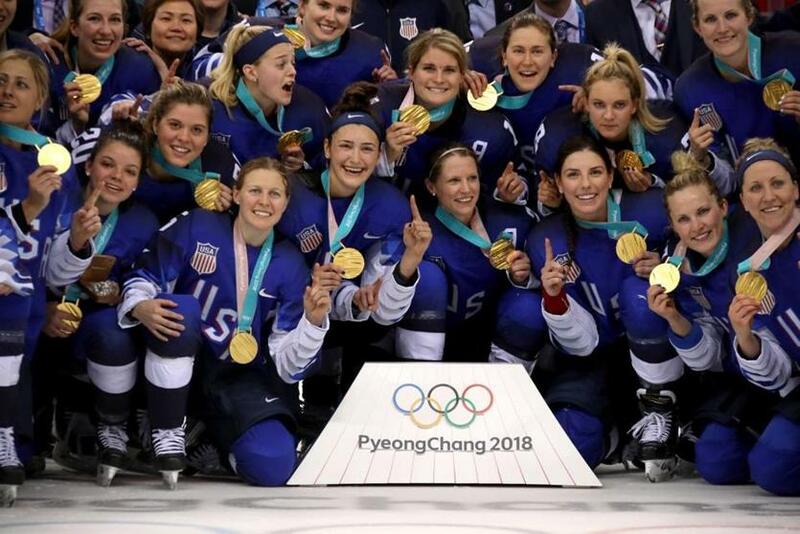 Oh, these women didn’t just beat Canada. They beat the world. 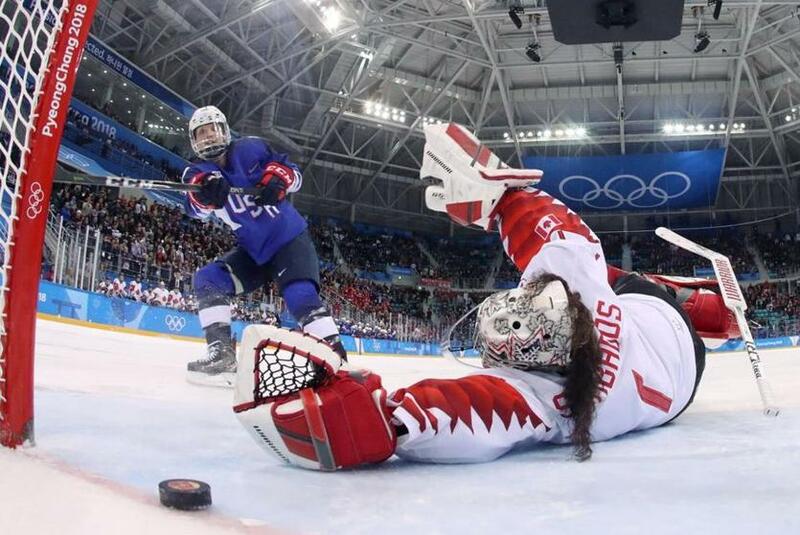 Jocelyne Lamoureux-Davidson beats Canada goalie Shannon Szabados during the shootout. “We’ve mentioned this the whole time: Our opponent is never the other team we’re facing,” said Marvin after she had, in fact, beaten said opponent by converting the Americans’ first shootout attempt. “It’s always the doubt. The thing is just the doubt and the fear. “We were able to push everything away. [We were] up, 1-0, then give up two goals, tie it, then we’re in a shootout. How many opportunities to mentally just cave? How many times? And we didn’t. We crushed the fear and crushed the doubt and just trusted in what was to come. She looked down at her chest, at the medal lying against her jersey, beaming atop the skates on her feet and pads on her legs. From Marvin to the twins, Jocelyne and Monique Lamoureux-Morando, whose breakaway stunner late in the third period tied the game at 2-2, from 20-year-old goaltender Maddie Rooney, the future of the sport, to veteran forward Amanda Kessel, who didn’t know for sure she’d even make this Olympic roster but who scored a vital fifth penalty shot to keep the Americans alive, this is a team that should never be forgotten. Not after what it did in the overnight hours in America, succeeding where the men’s team could not, but more important than that, clearing a hurdle that for so long it could not. Proudly showing their new gold medals. As the US women’s soccer team showed us in 1999, it is never too late for a new sports day to dawn. If Brandi Chastain could pull off a jersey to wake up the world, these women threw down their gloves and flung out their sticks to sound a similar bell. Draped in their flags, lost in their hugs, awash in their anthem and alone in their joy, they are our newest American heroes. “What a way to come through,” said forward Hilary Knight, whose perfect backhand tip accounted for the US’ first-period lead. “I was jumping on my couch 20 years ago watching Cammi Granato and Team USA win. To be able to be here 20 years later and win a gold medal, it’s pretty amazing. Make it happen, America. They deserve it. A medal ceremony that was 20 years in the making.